Clinton is the first major American candidate to run as a card-carrying feminist. That's an important point. It explains why she is both loved and hated, as Nixon was, before she takes the stage. Feminism has been around for about 40 years now and Clinton has been a figure in all of it -- from her Wellesley thesis on Saul Alinsky, through Watergate (she's the young woman helping present the impeachment papers above), and through all the issues the movement has sought to address -- education, health care, equality. Throughout the era of the Nixon Thesis, Clinton has been part of its AntiThesis, and on its enemy's list. This is far more history than anyone has ever come to a Presidential race with. It is twice as much history as Nixon brought with him in 1968, and twice as much baggage. None of the 1968 Republican contenders had been active fighting the New Deal in the early 1930s. This gives Clinton a base of support, and a base of enemies, not unlike that which Nixon brought to his 1968 race. Only in this case it's deeper and broader, on both sides. 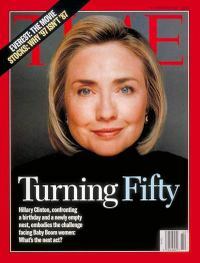 With Hillary Clinton we get to re-live the past of the Baby Boom generation into the indefinite future. Which explains Obama's appeal to younger voters. But my problem with Clinton is different. It's her brain-dead politics in areas I know something about. Take her "plan" for "rural broadband," announced a little over a week ago. It's a subsidy for the Bells. Believe it or not. After 10 years of watching the Bells pocket government money without doing a damned thing for anyone but their shareholders, Clinton proposes to throw them more money so they will wire rural America with broadband. The better plan is to let the Bells fail, encourage new companies to buy their rural networks, and support higher power limits on 802.11 signals in rural areas. It need not cost a dime. How can she be so stupid? Again, it has to do with her history, in this case her history as Bill Clinton's wife. After 1994, Bill Clinton turned sharply right, courting big business, and this proposal is a reflection of that. What Hillary Clinton's right-wing critics don't understand is that this Clinton AntiThesis is hated by the people who became the Netroots and the bulk of the Democratic Party. It's felt, and I think correctly, that this Clintonism led directly to Bushism, in the same way Neville Chamberlain led to World War II. The fact may be hard for conservatives to get their heads around, but it's there. By seeking accommodation throughout the 1990s with the likes of Newt Gingrich, the Clinton Administration set the stage for the kowtowing by Democrats which got us into Iraq. Thus liberals see Hillary Clinton as a Lady MacBeth character, enabling the bloodshed and all the rest of it. When Howard Dean said four years ago he wanted to represent the "Democratic wing of the Democratic Party," he was arguing against her. Can someone with this much history, hated so violently by both sides of the political aisle, possibly become the next President, possibly become a great President?